Clear blue square glass cubes electrical warmer. Clear brown square glass cubes electrical warmer. Clear green square glass cubes electrical warmer. Clear orange square glass cubes electrical warmer. Clear pink square glass cubes electrical warmer. Clear purple square glass cubes electrical warmer. 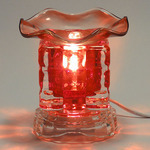 Clear red square glass cubes electrical warmer. Clear green square glass dimple electrical warmer. Clear orange square glass dimple electrical warmer. Clear pink square glass dimple electrical warmer. Clear orange square glass icecle electrical warmer. Clear pink square icecle electrical warmer. Clear blue square glass electrical warmer. Clear black square glass electrical warmer. Clear brown square glass electrical warmer. Clear square glass electrical warmer. Clear orange square glass electrical warmer. Clear pink square glass electrical warmer. Clear purple square glass electrical warmer. Clear purple "crystal ball with bubbles surrounding" glass warmer. Clear blue "crystal ball with bubbles surrounding" glass warmer.